Katmai contains some of Alaska's most spectacular scenery. From the rugged coast and peaks of the Aleutian Range in the east, to the low mountains, rolling hills, wild rivers and streams in the west, caribou, moose and more than 2,000 brown bears live in this wild and remote place, along with a wide variety of birds, insects and other fauna. The lakes, particularly those at the lower elevations, teem with salmon, trout and other fish species. The world's largest sockeye salmon run takes place in the Katmai region every July. Humans have lived in the harsh conditions of Katmai country for thousands of years. Flaked stone found on Takli Island indicates human occupation beginning as early as 9000 years ago. Early residents probably lived along the bays and inlets of the park's eastern boundary, and used much of the interconnecting coastline for fishing, hunting, or for temporary shelter. Inland, along the Brooks River, archeologists found artifacts dating as far back as 4500 years ago that provides evidence of an extensive village inhabited almost continuously since that time. Due to its significance, the Brooks Camp area was listed in the National Register of Historic Places in 1977, and designated a National Historic Landmark in 1993. In the late 18th century, Russian fur traders were the first Europeans to arrive in Katmai country. By then, the Alutiiq had established villages along the river coastlines. A complex economic and cultural relationship developed between Native peoples and the Russians. During the early and mid-nineteenth century, Russians considered Katmai village to be the most significant post on the upper Alaska Peninsula. Few Russians actually lived there, but observers estimated that 2000 to 3000 sea otter pelts were harvested each year. Katmai was declared a national monument in 1918 to preserve the living laboratory of its cataclysmic 1912 volcanic eruption, particularly the Valley of Ten Thousand Smokes, a spectacular forty-square-mile, pyroclastic ash flow deposited by Novarupta Volcano that is up to 700 feet deep. 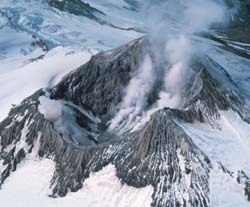 On September 24, President Woodrow Wilson signed the proclamation, which stated “Mount Katmai … has proved … to be of importance in the study of volcanism, inasmuch as its eruption of June, 1912, was one of excessive violence, ranking in the first order of volcanic eruptions … The results of this eruption are still fresh, offering excellent opportunities for studying the causes of the catastrophe and its results … The Valley of the Ten Thousand Smokes, a valley of hot springs in a condition of development towards a possible future geyser field .. This wonderland may become of popular scenic, as well as scientific, interest for generations to come, inasmuch as all the phenomena exist upon a scale of great magnitude, arousing emotions of wonder at the inspiring spectacles, thus affording inspiration to patriotism and to the study of nature” (Proc. No. 1487) but also its “features of historical and scientific interest and … brown bear, moose, and other wild animals” (Proc. No. 1950). Since 1912, Katmai has been expanded four times as its country has become better known and appreciated as a valuable storehouse of biological diversity and cultural heritage. In 1980 the area was designated a national park and preserve. Most of the surface geothermal features have cooled in the Valley of Ten Thousand Smokes, but the protection of brown bears has become an equally compelling charge for Katmai. Katmai is a world-class destination for fishing and for wildlife observation.